Musings about cutting stencils and stenciling cookies. I love stenciled cookies, and have tried making them a few times with limited success. Needless to say, I didn’t let that dampen my enthusiasm. Because I only make cookies for my grandkids (hence the name Nanagrams), I have the luxury of playing around with designs. A cookie doesn’t have to be professional looking to taste great, and nobody minds eating my mistakes! Many years ago I did a little bit of scrapbooking, and when Silhouette came out with a cutter (about 10 years ago), I bought one immediately. I had visions of making many scrapbook pages of beautifully cut designs. After I got my machine I tried to cut some card stock, and couldn’t even make it cut a simple shape. Convinced I was an idiot I put it back in the box, where it sat in the back of a closet until two weeks ago, when someone told me about a new group on Facebook dedicated to cutting stencils for cookies using a Silhouette machine. I joined the group and decided to give the machine another try. I finally figured out what I had done wrong all those years ago. It’s amazing how much you can learn by reading the manual! They have since come out with several new, improved machines, but I am very happy with this one and have no plans to upgrade. There is definitely a learning curve, and I hit it hard when I set out to stencil my first cookies. As I always do when learning a new technique, I watched several videos and read a few blog posts to learn how to do it. The most important things I learned were that you need to secure your stencil so the icing doesn’t leak under the stencil and that your consistency has to be right. If it’s too thin, it will leak under the stencil and if it’s too thick, it will drag and distort your stencil. I have found a toothpaste-like consistency works best for me. I learned about using magnets to secure your stencil on Sweet Sugarbelle’s blog. That worked okay for me, but I was still getting a lot of messy looking cookies. 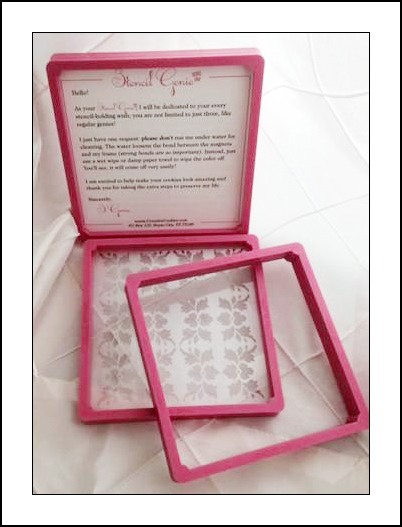 I also read about the Stencil Genie, which provides a frame to hold your stencil in place over your cookie while you decorate it. As this is just a glorified hobby for me, I was having a hard time justifying buying a new tool to decorate cookies. My sister is relatively new to this crazy cookie-decorating hobby, and has volunteered to make 200 cookies for her local SPCA. We talked about the Stencil Genie and wondered if using that would simplify the process. Voila! I had found just the motivation I needed to purchase the Stencil Genie and give it a try! Below are my impressions of using the Stencil Genie to stencil cookies. I have not received anything in exchange for this review, and these opinions are mine alone. This is what the Stencil Genie looks like. The frame comes in two pieces, and the stencil is held between them with very strong magnets. There is a thin side and a thicker side to accommodate different cookie thicknesses. I have to tell you that this little tool is a game changer! 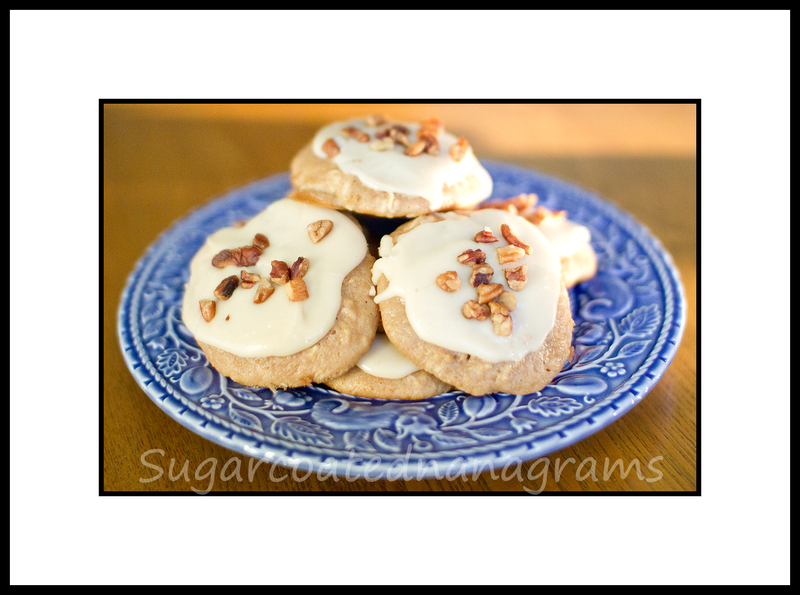 It made stenciling my cookies so much easier, and was remarkably easy to use. My hands can be a little shaky, and this really helped to keep the stencil steady. Though pros typically use an airbrush machine when using stencils, I use only royal icing, and it worked perfectly. If you are serious about stenciling cookies, then I highly recommend getting one of these for yourself. I sent mine to my sister for her to try, and am confident that she will love it as much as I do. This was my first try with the Stencil Genie. I cut the stencil using my Silhouette machine and used the Stencil Genie to apply the icing. After I sent mine to my sister, I had to stencil a few more cookies. It was so much more difficult without that little tool, so I have decided to let her keep it (surprise Peggy!) and will order another one for myself! 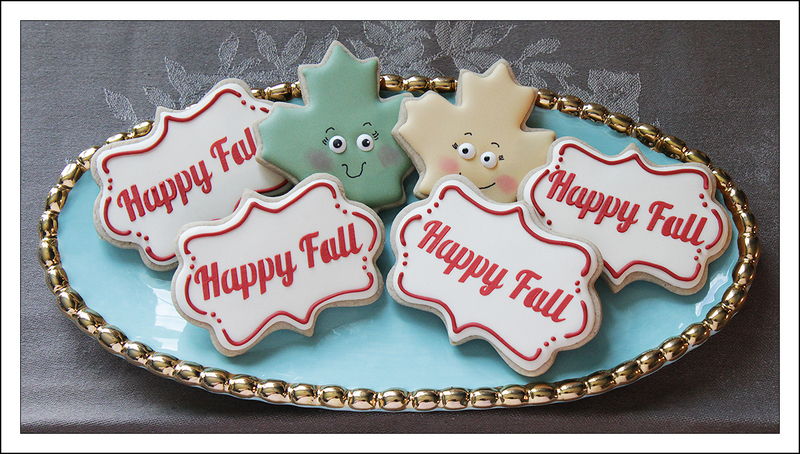 Wishing you and yours a very Happy Fall!